The finishing hole on the Composite Course has almost no undulation from tee to green but the angle of approach to the green, especially if the pin is cut in the right half is paramount. The fairway stretches far to the right and has no fairway bunkers. 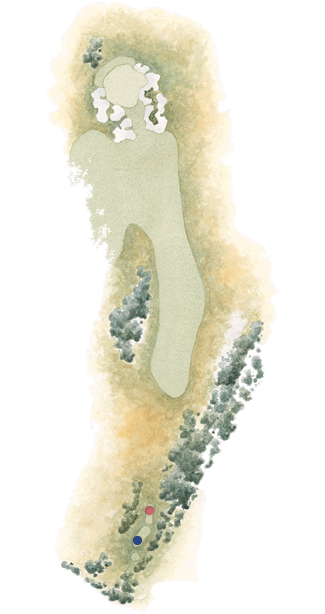 The inside of the dogleg, however, is protected by a clump of tea-tree that guarantees any player that flys their ball to far left are faced with a pitch out at best. It is very easy for the fearful driver to turn what is usually a reasonably easy hole into one that is much more difficult. Apart from a perfectly position drive every approach shot to the large two tiered green will have to carry one of the green side bunkers.